Have you heard of The Herbal Academy’s new online resource for all things herbal? Here is our review of Herbarium and what every herb lover can expect to find there. HANE is an affiliate of mine because I am simply so impressed with their work. They take the huge concept of herbal medicine and make it manageable for us every day people. If you haven’t tried their Introductory Herb Course or their Intermediate Herb Course, I highly recommend them. All online, all at your own pace and very well done. Their new site, The Herbarium, is a digital reference library for your studies. As my blogging friend Chris, from Joybilee Farms points out in her review, you’re going to need high speed internet to enjoy this site. The graphics are breathtaking and so helpfully full of detail. However, they’re coupled with videos and lots of text so you’ll want some good digital speed. Unlike their courses, this site is meant to be like an interactive collection of the coolest herb books you’ve ever read and like having a congregation of all your herbal mentors in one place. Candyland for the herb-nerds like me! In The Herbal Academy’s own words. We are herbalists, a spirited group of individuals from all walks of life, joined together by our gratitude for nature and our desire to live and heal with plants. Along our herbal journey, we have grown closer to the earth and closer to the fellow beings whom it sustains. We have learned and continue to learn how even the smallest, seemingly insignificant plant has value. Real value — to its ecosystem and to us. There’s a LIBRARY tab and from there you’ll find articles, videos, print outs like recipe cards, spice information and information on HANE’s new e-book. Hold the phone – new book?! Uh, yeah – Cooking With the Seasons. With membership in the Herbarium, you get access to this book AS WELL AS every other e-book they publish this year. There’s also a shop page where you can find all HANE’s products. There’s also the MONOGRAPH section which is full of specific information for specific herbs. There are all kinds of search parameters: how to use, herbal action, taste, how to prepare, etc. My son has been struggling to get rid of bronchitis and I’m looking for something to help him with his breathing. I wanted to know more about licorice root for that, so I popped that into the search. I learned so many things I didn’t know, and I’ve used licorice root a lot. Any season of the year, for any herbal need you have, you’re bound to find something of value in Herbarium. Part of why I love Tasha Tudor, Little House and the homesteading lifestyle in general is the rhythm of life that one adopts. I need to rest in winter; move slower, eat broth and make plans for future herb gardens. In summer, I’m all movement and watermelon and bare feet. 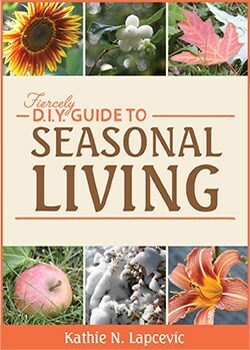 Seasonal eating, seasonal living – seasons! Important to ebb and flow. Herbs work their way easily into our everyday during the year. You harvest them during the growing season, then preserve and make use of them as the cold winds of winter blows. For more information, be sure to visit The Herbal Academy’s site and poke around Herbarium. Be sure to visit the sections I haven’t even mentioned! For example, the downloadable media, handpicked gems by the Academy staff, an online community and so much more.